Thought Balloons - Creating Comics One Page At A Time: The President of The United States. – Four Years. – Shaun Richens. The President of The United States. – Four Years. – Shaun Richens. PAGE ONE - 7 PANELS. 1. On the bridge of the H.A.M.M.E.R Helicarrier. BARACK OBAMA is talking to the new leader of the organization, NORMAN OSBORN. The president has bodyguards in suits and shades with him. A few members of H.A.M.M.E.R are at work around the room. We have witnessed dark times. 2. In the city of Broxton, Oklahoma. Captain America, Thor and some Asgardian Warriors walk the streets with OBAMA as crowds cheer them on. We have had are very freedoms besieged. But had heroes rise to defend them. 3. A close up on Thors hammer MJOLNIR. It rests in a crater handle pointing skyward. Sadly we have seen heroes fall in the very face of fear. 4. OBAMA stands at a podium on a stage talking to a large crowd of reports and citizens. The white house stands proudly in background. The day is bright and clear. These four years have tested all of us, even our greatest heroes. But we have come out together and far stronger for our hardships. We stand as one. Truly united as one great nation. Now is the greatest moment to call yourself an American. As we move forward to the next four years. 5. OBAMA walks down the steps at the side of the stage, flanked by bodyguards. The two s.h.i.e.l.d agents from the picture above stand waiting to talk to OBAMA. 6. 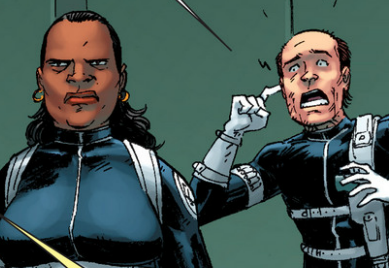 The woman S.H.I.E.L.D agent, PRESTON approaches the President. Wonderful speech Mr. President. I am sorry to say I am here with bad news however. 7. Close up on PRESTONs face. She looks worried at what she about to say. He is coming to kill you. I'm not sure I 'got' this page at all. It built quite nicely with a serious tone, then that last panel threw a curveball. Hurm. Maybe it's just me? My aim was kinda to try and show that no matter how serious Marvel try to make their big events you also have some really goof stuff going on as well, I wanted to try and use the President as the bridge between them, he'd be the guy who would have to deal with both sides.